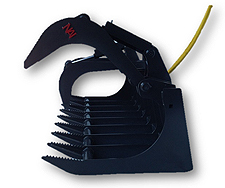 NAI's Extreme Root Grapple is an excellent attachment for the tree industry, contracting industry, farm industry, scrap industry as well as the grading industry. It is also essential for storm damage clean up. The Extreme Root Grapple is superb for moving logs, brush, rocks or just about any type of debris. Each of NAI's hydraulic cylinders has a 2 inch bore with a 10 inch stroke and operates independently to adjust for uneven loads. All of NAI's Extreme Root Grapples are built with 5/8 inch top quality A-36 steel with counter-sunk grease pins and bushings at all hinge points. Each cylinder comes with a heavy duty cylinder cover for extra protection.